← My Boys Can Bike! What Happened to that Cereal? Lori asked a couple weeks ago how things were going with those simpler breakfasts I was committed to making this year. “CEREAL ON SCHOOL DAYS!” I had proclaimed in the fall, suggesting we’d be doing “breakfast boot camp”. 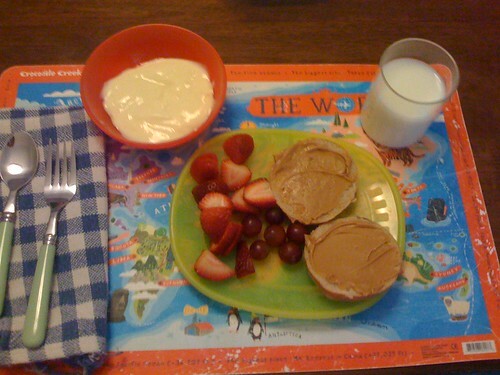 And then I laughed just a little bit harder when I put a plate down on Lyle’s placemat that was similar except that the mini bagel was just a bit more toasted and had cream cheese on it. I mean, it’s a great breakfast and all, but the time it takes to put two meals like this on the table on a day when we’re getting two kids ready for school and two adults out the door for work is simply ludicrous. This entry was posted in parenting, resolutions. Bookmark the permalink. My son took a liking to fried eggs this year. His b’fast of choice is two waffles and a fried egg. The farmboy special. Needless to say, we’ve whittled that one down to once a week. That’s a great-looking breakfast!! We have one porridge child, one OatFlakes child and one WeetBix child. It means 3 different breakfasts, but I’m happy to provide…. We let them loose in the term holidays – they get one box of fun cereal although the choices in that dept are more limited down here in Oz than in the US. LOL! My son would have pancakes every morning if he could. I make them a few times a week…the other days are Wheaties days. It looks so healthy and yummy! I would love to do this every day for the kids (and myself!! ), but it is just too crazy during the week. So, we do fruit and cereal every weekday. Fortunately, my boys do love cereal, so it makes it a bit less guilt-inducing. But now I am hungry…fried eggs, porrige, pancakes, strawberries….Yum! I am so with you on this. I mean, sure, my kids get a nutritious breakfast, but what happened to cereal? My sisters kids get up and feed themselves cereal every morning, she isn’t involved at all. At my house, if I mention cereal, I get all kinds of whining. I think I really missed the “keep it simple” lesson with this one. But I should blame my husband because when he makes pancakes he will make plain, chocolate chip, sprinkle, and banana. What’s wrong with ONE choice??! Sheez. this looks so lovely and colorful and delicious, too! can i come over tomorrow morning? hmmmmm? I let them have “Saturday cereal” on Saturdays, when they are allowed to watch cartoons. Cinnamon Life, Honey Nut O’s, etc. The rest of the week, it’s Cheerios or oatmeal. Spartan. My German husband’s influence. Bleak. What a lovely breakfast! And a cloth napkin – good for you! Pretty AND eco-friendly. You’ve inspired me. Next year they make their own breakfasts? I got these fancy little cheese spreaders at Wegman’s and my girls love them! I wish I could get mine to go for that much variety at breakfast! AntoshkaPaf on Now You are Six. TomitoysSlots on Now You are Six.